A Pega-Rabuda: Paint me a doudou! If translation was possible, this was the one for Raquel's new great (and beautiful) idea. But first: who is Raquel Devillé? Raquel is one of the artisans with blogs that I follow longer. She is a mother, a woman, and a great artist and person. Everything that comes out of her hands is done with love and meticulous perfection. 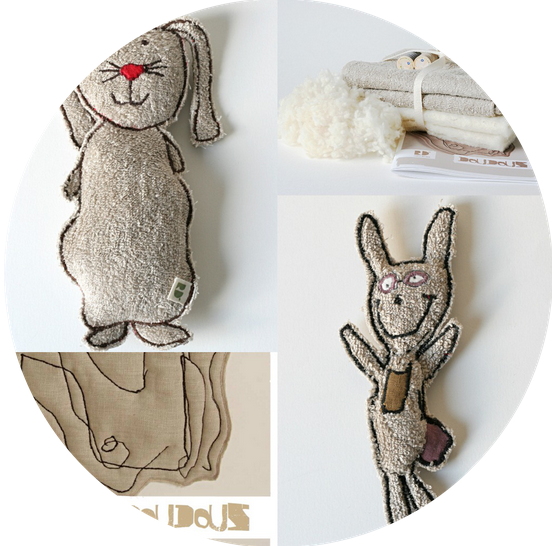 Today I want to show you the new kits from Rachel " Dessine - moi un Doudou " . For those unaware, the puppets made ​​from children's drawings are famous around the world. Now, Rachel teaches how to do them to anyone who wants to sew one. Great idea, isn't it? The kits come with detailed instructions and materials of unsurpassed quality - Rachel only works with the best raw materials! If you didn't notice, there is also an online course that will begin early this November. I think the idea of ​​the existence of these online classes just awesome, and I'm sure it will be a pleasure to learn things with Raquel - I speak for myself : I've learned very much from her. So, from today on you will find a button to her blog on this blog. Because, to me, it will be an honor if someone comes to know her work through this my little virtual home - my blog!